Hideous maniacal laughter shattered the dark silence of ghostly tenements. Sleepy-eyed men and women, stumbling through the dim halls of the building, found a sight that chilled their souls with terror. On a blank wall, spikes driven through her, hands and feet, blood coursing down her arms and breasts in tiny rivulets, a beautiful young woman was hanging, crucified, dying. Still another victim of the Torture Trust! And while panic spreads, while hundreds die victims of the Killers, the Spider is blinded, his faithful servants imprisoned, his friends dishonored! How can Richard Wentworth, desperate and alone, combat the powerful, well-organized Murder Syndicate whose gun hirelings hunt him down like a vicious mad dog? 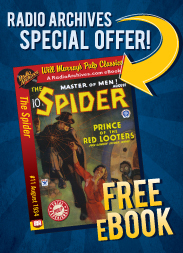 The great pulp magazines of the 1930s and 40s produced a number of heroes, but none as action-oriented as the Spider. For almost exactly a decade, from October 1933 to December 1943, the Spider was the scourge of the Underworld, doling out his own particular brand of justice and imprinting his dreaded red Spider seal on the foreheads of those he has killed for the good of mankind. The Spider followed the established pulp pattern of a wealthy man-about-town, Richard Wentworth III, master of disguise, dilettante of the arts, in perfect physical condition, and completely devoted to the pursuit of justice for the down-trodden, no matter what the cost to himself or loved ones. Secretly donning a decrepit black hat, a tattered black cape, a false hunch to his shoulders, a lank wig of stringy hair, an application of sinister face makeup and a pair of .45 automatics, Wentworth prowls the streets of New York as his alter-ego the Spider, chasing down criminal masterminds bent on enslaving or destroying humanity. Nick Santa Maria brings the action to electrifying life in Death's Crimson Juggernaut. Originally published in The Spider magazine, November, 1934. Chapter 4: Into the Trap! Chapter 10: Beware the Lamb!